Promethease was the first service I investigated because the company is among the few who directly accept data from Geno 2.0 (as opposed to 23andMe and other, more popular kits). I like this particular service because it emphasizes medical traits, rather than ancestry information, making it complementary to the results reported by the National Geographic program. The processing is done by a privately-held biotechnology LLC, and the analysis cost me $5.00 via an online payment. The top results for the Promethease screening output. 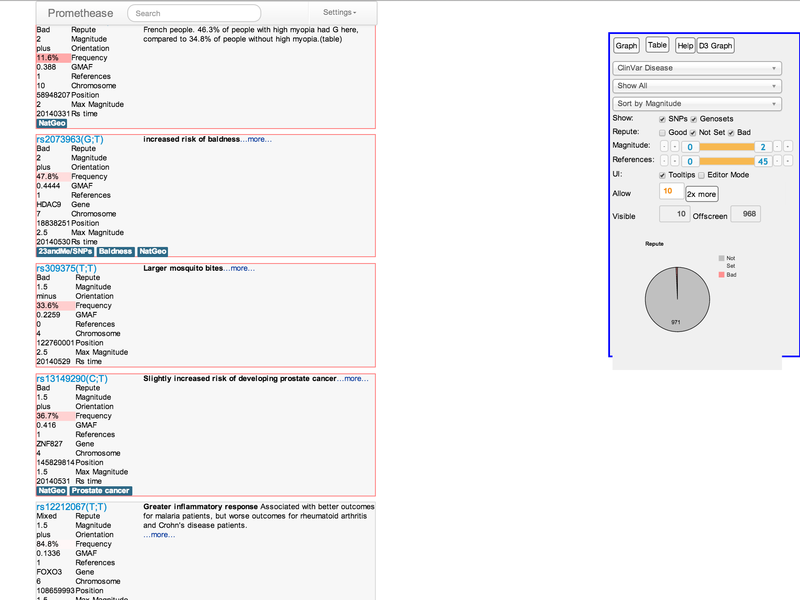 The left column is a list of all SNPs recognized from the Geno 2.0 results, and the right column is a live-editable search specification box that can be used to refine search results. The figure shows several example results listings from Promethease. The results specify a full list of SNPs identified with the software, as well as annotations associated with those SNPs that are provided by Promethease’s community of scientists and users. The founder notes that the results tend to favor negative traits (outlined in red boxes in the figure) because there are more studies showing that “Trait X causes cancer” than there are showing that “Trait Y causes superpowers.” The results are sorted by the “magnitude” of the effect, which is a subjective ranking of how severe or telling the presence of the SNP ought to be. More telling, however, is the “frequency” tab (highlighted in red in the results), which gives a rough estimate of the fraction of the US population that shares that particular SNP. For example, I was a little concerned to see that I had at least two SNPs associated with male-pattern baldness, but then I noticed that the relative proportion of the population bearing each of the two SNPs was 50% and 84%—dispiriting news, certainty, but hardly a uniquely bad outcome given that at least half of US males go bald by middle-age. The only good news I received was that I have an increased inflammatory response to mosquito bites, which is apparently associated with increased resistance to malaria. Overall, I was satisfied with the results provided by the service, although it was clear that the total information provided by the Geno 2.0 test (~1000 SNP) was lacking in comparison to that provided by other genetic testing kits (~17,000 SNPs are analyzed for 23andMe data). The medical results are more interesting and specific than those provided by the Genographic database, and they definitely made me more interested in using another testing service in the future in order to gain even more information about my genome. 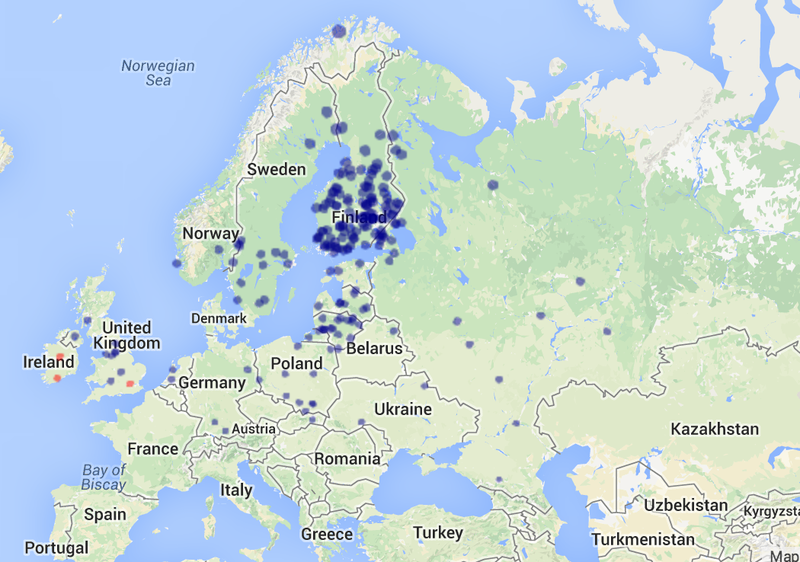 The prevalence of my paternal ancestors bearing two specific SNPs with Haplogroup I. The locations of known ancestral groups bearing the SNP N-M178 in the male haplogroup. Overall, the service didn’t tell me much more than Genographic’s existing analysis, although it was cool to see the localization of various SNPs on heat maps. The service did very little with information about my maternal line, which is arguably more interesting because it would contain only Southern Asian traits. Instead, the only other information offered about my maternal heritage was a vague assurance that a kit-purchaser in the United Arab Emirates had received similar results to mine, against which I could compare mine for an additional fee. 3. Morley terminal subclade predictor. This is a quick tool that finds the terminal subclade associated with a list of SNPs from the Y chromosome. It operates using the list of SNPs detected by FTDNA, which can be copied and pasted into the simple interface. It predicted that my terminal subclade is I2a1c, which is associated with the Alpine region in Western Europe. No information about my maternal ancestry was available. 4. Interpretome. This Stanford-based tool provides a remarkably broad range of results and analyses for free. While the tool technically supports only results from 23andMe and FTDNA’s testing services, I was able to upload my Geno 2.0 data without a problem, although results should probably be taken with a grain of salt. While the website lacks fancy graphs and visualizations of my genetic data, it includes several unique tools for gaining additional information from the limited raw data available from National Geographic’s Geno website. For example, there’s a tool that takes my Autosomal DNA, combined with my age and parental heights, and predicts my actual height. Posted on 07/16/2014 by gammacephei. This entry was posted in Biology. Bookmark the permalink.